We knew it wouldn’t be long before AT&T stepped into the shared data plan game. You didn’t think it was going to be Verizon only, did you? The mobile landscape started changing years ago when tiered data was first introduced, but now more than ever, you will be paying a premium to take that smartphone of yours onto the web or into an app. Carriers realized that the money they were making from minutes and texts wasn’t going to hold up forever and that data was their new cash cow. 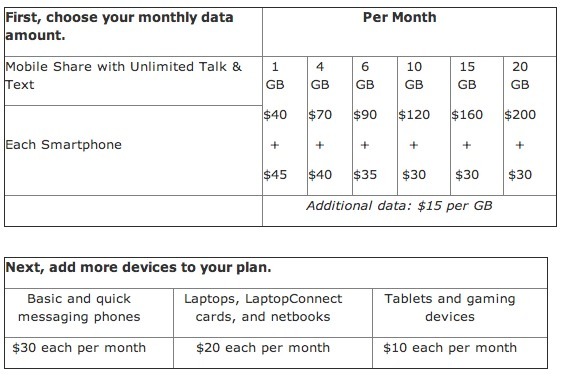 So AT&T’s shared data plans look a lot like Verizon’s in that you pay a flat fee for your phone and then pick from a variety of data options. Their’s differs in that as you buy a bigger data bucket, your per device monthly charge goes down. The first tier of 1GB is cheaper than Big Red’s at $40 and they are also not offering a 2GB plan. These plans will go into effect in August. For now (or at launch), they will allow you to choose between shared plans and their current plans, however, you have to expect that to change. The press release is below, but stick with us as we’ll have comparison charts to Verizon’s and also dive into the dirty details. AT&T* customers will soon have more options in choosing the plan that’s right for them and their mobile devices. With new AT&T Mobile Share plans, available in late August, new and existing customers can share a single bucket of data across smartphones, tablets, and other compatible devices, plus get unlimited talk and text. AT&T Mobile Share plans make it easy for customers to manage their data, voice minutes and texting, without needing to keep track of multiple plans. AT&T Inc. (NYSE:T) is a premier communications holding company and one of the most honored companies in the world. Its subsidiaries and affiliates – AT&T operating companies – are the providers of AT&T services in the United States and around the world. With a powerful array of network resources that includes the nation’s largest 4G network, AT&T is a leading provider of wireless, Wi-Fi, high speed Internet, voice and cloud-based services. A leader in mobile Internet, AT&T also offers the best wireless coverage worldwide of any U.S. carrier, offering the most wireless phones that work in the most countries. It also offers advanced TV services under the AT&T U-verse® and AT&T | DIRECTV brands. The company’s suite of IP-based business communications services is one of the most advanced in the world.